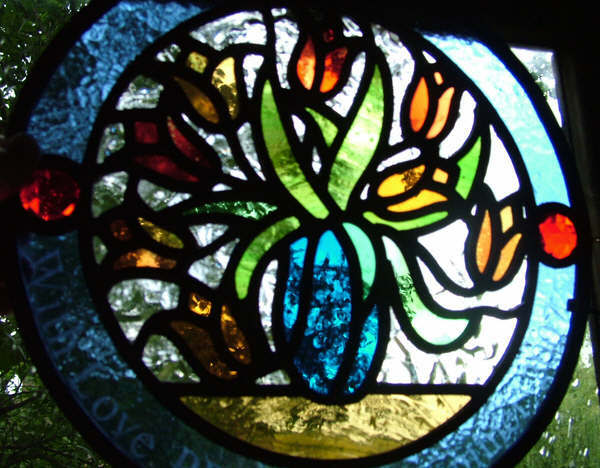 Tulips Stained Glass Rondel with Acid Etched Inscription. I was commissioned by some parents who were very keen to give their children’s teacher a special stained glass gift. She has a connection with Holland so we agreed on a vase of tulips. There is also some acid etched writing around the edge saying thank you and the date. I’m sorry this photo is not one of my best! Error: Error validating access token: Session has expired on Monday, 08-Apr-19 03:56:55 PDT. The current time is Friday, 19-Apr-19 11:37:58 PDT.